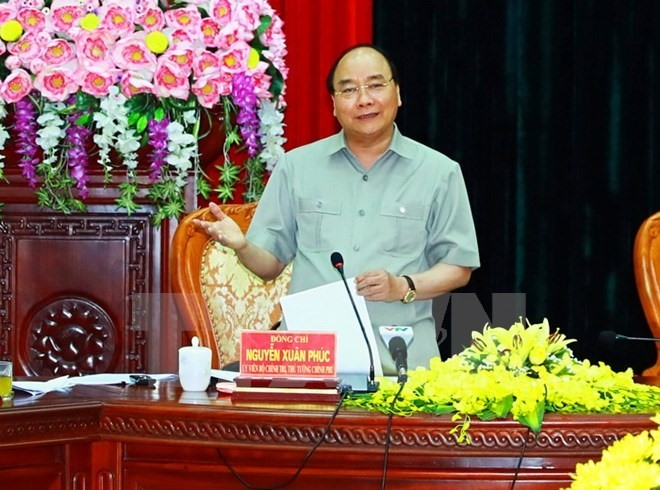 NINH BÌNH — Prime Minister Nguyễn Xuân Phúc urged the northern province of Ninh Bình to make tourism the driving force of the local economy, in order to turn the province into a must-visit destination in Việt Nam, during a working session with provincial authorities yesterday. Towards this goal, the province should develop its own brand, enhance connectivity with other provinces and cities and invest in human resources training and unique products, the PM said. He required the province to continue to review and fine-tune the management of regional, sectoral, land, natural resources and urban development planning, paying attention to the preservation and building of the Bái Đính - Tràng An relic site into a well-known spiritual and ecological tourist destination in Việt Nam and the world. As well as tourism, the government leader also called attention to support industries and traditional craft villages, particularly high-quality and safe agriculture. Considering business development as a crucial task, the PM told the province to strive to have at least 10,000 firms by 2020, doubling the current level. The province must closely partner with businesses and people, further improving its indexes on land and credit access in order to be listed among the top localities in the country in the ranking of administrative reform, he said. Chairman of the provincial People’s Committee, Đinh Văn Điến, reported to the Government leader that last year, the local economy enjoyed good growth, contributing VNĐ7.2 trillion (US$315 million) to the State budget. Tourism is a pillar of the province’s economy, with the number of tourist arrivals reaching 6.5 million last year. During his trip to Ninh Bình, PM Phúc toured the Hyundai Thành Công auto company in Gia Viễn industrial park, which is the second largest car factory in the country. At a working session with the Thành Công group, owner of the factory, the PM suggested the group promote partnership with domestic and foreign investors to expand production. He also urged the group to invest in the research and manufacture of car components and cooperate with research and training establishments to train a high-quality workforce in the field. On policies for the domestic automobile industry, he announced that the Ministry of Industry and Trade had been assigned to set up a working group to collect feedback and recommendations from domestic and foreign automobile firms, which would serve as a reference for the country to map out suitable development policies for the industry.